The King's Theatre pantomime is a long standing tradition in the Glaswegian festive calendar, and although the sets get more hi-tech as the years go on, their shows are always bursting with the festive family fun we've all come to know and love. From the moment the curtain lifts, the stage is filled with colour as we meet the residents of Pollok on the Park. Cinderella (Gillian Ford) is busy preparing for the return of her not-so-nice step sisters, Euphemia (Gregor Fisher) and Lavinia (Tony Roper). Add a lovestruck best friend (Des Clarke), a chance encounter with Prince Charming (Josh Tevendale) and his sidekick Dandini (Gary Lamont) and an invite to a royal ball and you have all the ingredients for a fairy tale ending. The cast are universally good making it almost impossible to choose a stand out. Fisher and Roper make for a great comedy double act, Ford and Tevendale succeed in bringing sometimes wooden characters in panto to life and Clarke and Lamont excel at keep the crowd engaged. The were joined on stage by youngsters from Gillian Whyte's Dans-Scene Company who rounded the whole production off with their enthusiasm and impressively polished performances. The show is packed with chart topping tunes and pop culture references, with some of the actors ad-libbing when interacting with the crowd. There are jokes and puns for both kids and adults to enjoy and a special appearance from Ian Lucken's Shetland ponies added some real magic to the night. Writer and Director Eric Potts and Morag Fullerton have knocked it our of the park with this year's offering, ensuring that everyone leaves the theatre filled with festive spirit. 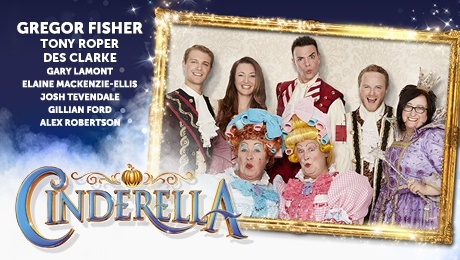 Cinderella is at the King's Theatre, Glasgow until Sunday 8th January.